The huge Walt Disney Studios panel just let out here at the D23 Expo, and if Disney was trying to leave an impression with media and fans, they truly succeeded. Previewing films from Marvel Studios, their animation and live-action branches, as well as Pixar, Disney brought out a ridiculous amount of clips, directors, and writers to talk about their upcoming films. We were provided with clips and artwork from Pixar’s 2012 and 2013 films, Brave and Monsters University, respectively. Pixar also surprised the D23 attendees with the announcement of two brand new (and completely original) films – one involving dinosaurs and the other focusing on how the mind works. Read on for a quick recap of the fantastic presentation! Director Mark Andrews and producer Katherine Sarafian brought some first looks at the upcoming film. We were shown an extended sequence of Merida practicing her archery and horse-riding skills. 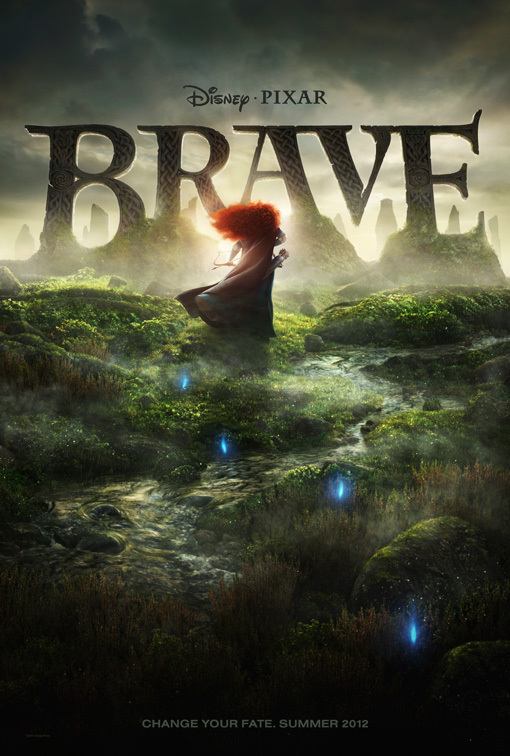 Additionally, actors Kelly Macdonald (Princess Merida) and Kevin McKidd (Lord MacGuffin) were also present to talk about their time on the film and present another clip with unfinished animation. It also involved some archery. When Pixar said before that Merida would be a great archer, they were not kidding! The first clip seemed to look finished, and it reminded us once again that the look of this film is absolutely stunning. Director Dan Scanlon gave us the first ever look at the world of Monsters University. While instantly familiar, due to the original Monsters, Inc., it looks like Pixar is trying to do something very different and unique as well. John Lasseter described the film as an “animated college movie.” The film is a prequel showing us a time when Mike and Sulley were not quite the best of friends. They are both 18 years old and some slight alterations have been made to their appearance. Mike is a bit shorter and has a retainer, while Sulley is thinner. Billy Crystal also surprised the audience with an appearance (and the crowd went NUTS) to talk about his return to Pixar. The movie is being directed by Bob Peterson (co-director of Up), co-directed by Peter Sohn, and produced by John Walker. It features a storyline where the asteroid that supposedly killed off the dinosaurs actually misses Earth. The result is a planet filled with dinosaurs. In a beautiful concept art piece, we were shown a large dinosaur with a possible figure of a child on top of it. It is due in 2013 (likely Nov. 27, 2013). This is set to be Pete Docter’s (director of Monsters, Inc. and Up) next film (it is being co-directed by Ronnie del Carmen). While it is in a very early stage, Docter gave us a few tidbits about the film’s premise. He said that Pixar loves to explore new worlds, so he was excited to work on this new movie that explores the inside of one’s mind. The question he posed to the audience – “What is going on in people’s heads?” – serves as the driving force on what the film will be about. It is set to hit in 2014 (likely May 30, 2014). This being the 25th Anniversary of Pixar, the audience was also surprised with a cupcake featuring the red, yellow, and blue colors of Luxo, Jr.’s ball. Everyone in the audience got one, so people were very ecstatic. Several Pixar directors came out onto the stage as attendees gave them a standing ovation. Overall, this was an amazing panel featuring footage and artwork that will not be seen by the public for a while. Needless to say, it is a great time to be a fan of animation. Let me reword that – it is a great time to be a fan of film. These new projects restate Pixar’s goal of being bold and maintaing the importance of great characters and spectacular visuals.